Lately, I have been trying to get more veggies in my diet without eating salads all day. These sugar snap peas did it for me. They are raw, crunchy, sweet, and salty. The sesame oil gives them a wonderful nutty flavour. They are so quick and easy to prepare and carry well, making them the perfect snack for work or a side with your meal. In a pan on medium heat, toast the sesame seeds. About 4 minutes. You will smell them and hear them pop. Remove from heat. 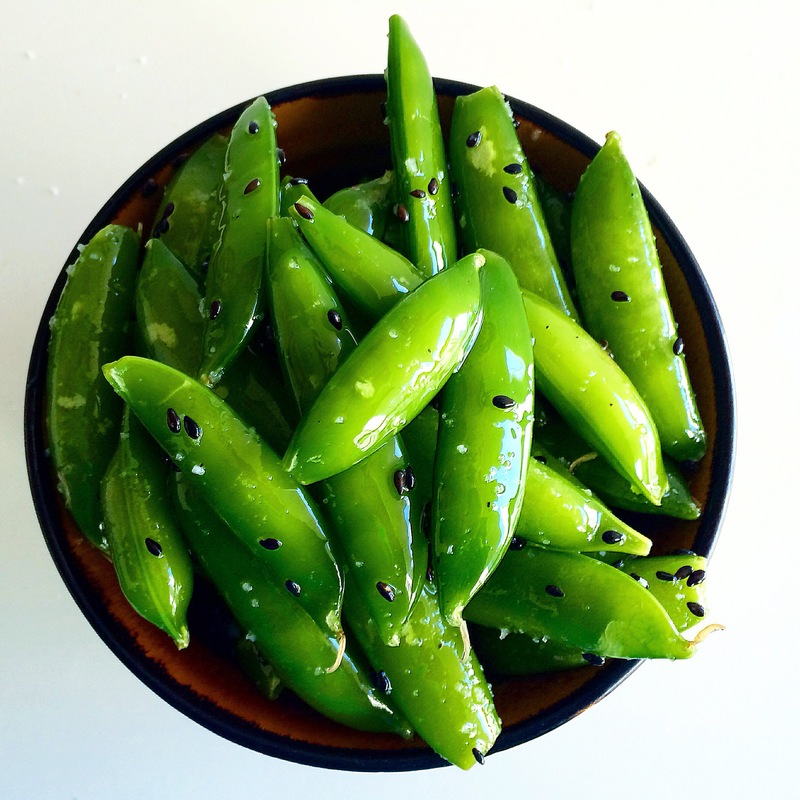 In a bowl, add the sugar snap peas and sesame oil. Mix well making sure all the peas are coated. Add sesame seeds, mix well. Add salt, mix and serve. I use fleur de sel to make these special, but sea salt works just as well. I also like to finish the dish with a little extra salt, especially if I’m entertaining. It gives the peas that extra salty bite. These can be stored in the fridge for up to a week. I like to pre-portion them and take them to work. So they are a grab and go snack. I never thought I’d so happily snack on a huge bowl of sugar snap peas but with this recipe, I can’t stop! Such a simple and easy recipe makes the most delicious snack! Craving something salty & crunchy? This is a healthy snack that is sure to satisfy! This recipe is delicious, healthy and so easy to make. I always get compliments when I serve it at parties. I also like to keep it in the fridge to snack on.